I believe it means that you clearly have all the major points to win a debate or conflict against an inferior opponent. Obviously, the locked out NFL referees believed that they had a lot of leverage, or else they wouldn't have dared to challenge the mighty National Football League. Sadly, the regular officials clearly miscalculated how valuable they are to the league. I told my dad after the first regular season game that if that's how well the games are going to be officiated by the replacement referees, then the locked out officials will have to swallow their pride and beg the NFL for their jobs back, because they certainly won't be making the league cave to their demands. The point is, when you are an athlete holding out for a bigger contract, or in this case, a group of officials holding out in solidarity for better benefits, you better make damn sure that you are irreplaceable, because if you aren't -- you'll be crawling back on your hands and knees with your tail between your legs. I mean, do you really think these refs will get even remotely close to what they are looking for? 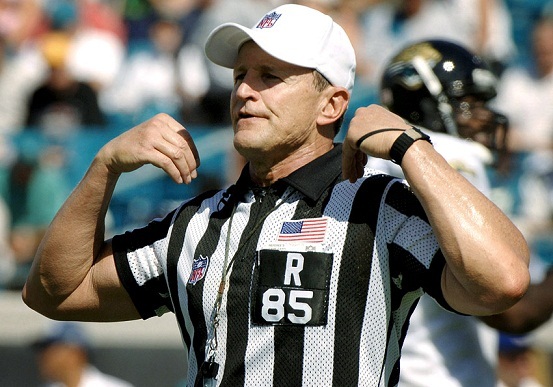 The NFL didn't cave to the players and they certainly aren't going to give in to the officials when the replacement refs are doing an admirable job. At this point, what could give the locked out officials any leverage? Some player getting paralyzed based on a missed call? A team losing a key game on a blown call? I honestly don't think the replacement refs will ever be so bad that the league will suddenly be like oh man we've gotta give the old officials what they want and get them back in here as soon as possible. The locked out officials need to take a lesson from Maurice Jones-Drew and get back to work, because Roger Goodell and the NFL have made it clear that the show will go on -- with or without them. I completely DISAGREE with this ENTIRE post. You obviously haven't watched any games over the last few weeks, because these replacement officials are getting worse week to week. There were SO MANY blown calls this weekend that it was sickening. It's getting to the point where the games are almost hard to watch because of how poorly they are being officiated. I'd say that gives the referees on strike PLENTY OF LEVERAGE. The league needs to give the regular guys what they want and get them back in there NOW. They made a lot of mistakes in the Redskins game this week. If you think the replacement officials have done a good job to this point, something is seriously wrong with you. The officiating has gotten progressively worse with each passing week. They did alright in week 1, but they were absolutely TERRIBLE in almost EVERY GAME I watched this weekend, and I have Sunday Ticket, so I pretty much saw bits and pieces of ALL the games. This whole thing is getting ridiculous. This is PROFESSIONAL FOOTBALL. Get the damn PROFESSIONAL OFFICIALS back in there already!!! My point is that they are doing good enough that the NFL can wait the officials out. It doesn't matter what any us fans think, it only matters if the NFL will lose something significant with the official refs and they won't. You gonna stop watching the games because of the refs? Uh nope, so it's only a matter of time before the real refs will cave and come back or else the NFL will just keep using the replacements. I'm not saying I agree with it, but when does the NFL ever cave to anybody they feel they can bully? When you put it that way Kyle, you're exactly right.